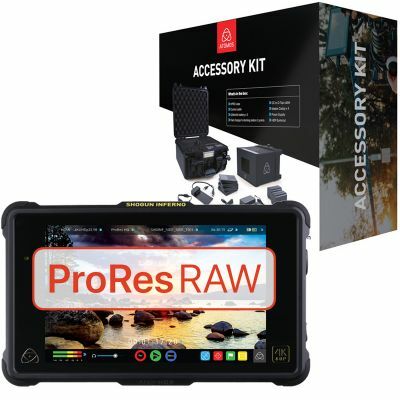 This Kit consists of the Shogun Inferno and the Atomos Accessory Kit, which includes everything you'll need for a complete workflow with your Shogun Inferno monitor/recorder. Atomos invented the all-in-one monitor recorder category and now redefine it with the Shogun Inferno. It is the combination of the most advanced monitor technologies – 1500nit/10bit/HDR, the latest recording capability – 4Kp60 over Quad-SDI, along with playback & editing functionality that encourages on set collaboration. Shogun Inferno makes mastering a high resolution, high frame rate, high dynamic range workflow available to all filmmakers. Our built-in armor enhances protection & airflow whilst the raft of accessories (2x NP series 4-cell batteries, fast battery charger, USB3 docking station, XLR breakout cable, Lanc cable, DC to D-Tap cable, 5x Master Caddy cases, DC adapter & HDR sun hood) and the premium HPRC flight case ensures you're ready to hit the field immediately.